The annual event will be held at the home of Becky and Max Corns at 6685 Boyd Road. Becky said that there is no admission to the event and that there are necessary facilities located around the sale, including bathrooms. 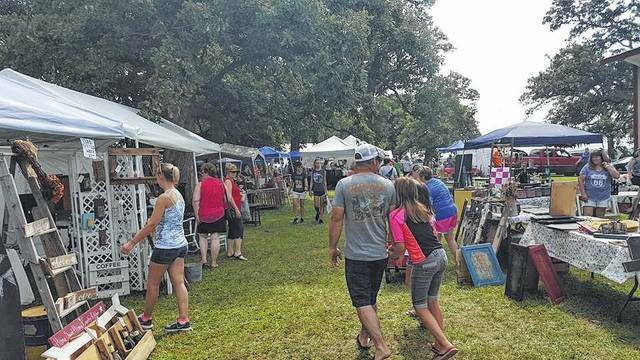 The sale will start at 9 a.m. on Saturday, Aug. 5 and will remain open until 6 p.m. Then on Sunday, Aug. 6 it will open from 11 a.m. until 4 p.m. Pictured are vendors and buyers from last year’s event. Becky Corns, with Becky’s Country Candles, will hold her annual “Crafters Sale” Aug. 5 and 6 with over 170 vendors participating over the weekend. Pictured are vendors and buyers from last year’s event. Becky Corns, with Becky’s Country Candles, will hold her annual “Crafters Sale” Aug. 5 and 6 with more than 170 vendors participating over the weekend. The annual event will be held at the home of Becky and Max Corns at 6685 Boyd Road in Fayette County. Becky said there is no admission to the event and that there are necessary facilities located around the sale, including bathrooms. The sale will start at 9 a.m. on Saturday, Aug. 5 and will remain open until 6 p.m. Then on Sunday, Aug. 6, it will open from 11 a.m. until 4 p.m.
After a successful first year, the couple decided that they wanted to continue donating their time and space to be used for this large vendor fair. 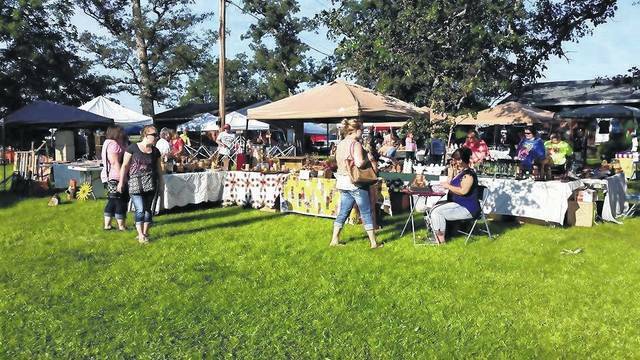 This year makes the third-annual event and Corns said it will include food vendors, free parking, multiple shuttles coming between the parking lot and the sale site, and benches to rest at while at the sale. This year’s vendors include Henna Tattoo Artist (Penni AlZayer), food vendors, Paul’s Potatoes (Frye Trailer), Miami Trace Athletic Boosters Food Trailer, Primitive Crafts, furniture, quilts, candles, scentsy, Broken Yolk Antiques (Ben & Joni Thacker Smith), Jamberry, Pampered Chef, Primitives by Nikki, Gypsygal Boutique Van, Signs by Norm Caplinger, jewelry of all kinds and even a Pony Petting Zoo provided by Michele Snider on Aug. 5 from 9 a.m. to 6 p.m.
For more information, “like” the Becky’s Country Candles Crafters Yard Sale event page on Facebook or contact Becky Corns at (740) 335-5680.
https://www.recordherald.com/wp-content/uploads/sites/27/2017/07/web1_Crafters-Event-2.jpgThe annual event will be held at the home of Becky and Max Corns at 6685 Boyd Road. Becky said that there is no admission to the event and that there are necessary facilities located around the sale, including bathrooms. The sale will start at 9 a.m. on Saturday, Aug. 5 and will remain open until 6 p.m. Then on Sunday, Aug. 6 it will open from 11 a.m. until 4 p.m. Pictured are vendors and buyers from last year’s event. https://www.recordherald.com/wp-content/uploads/sites/27/2017/07/web1_Crafters-Event-1.jpgBecky Corns, with Becky’s Country Candles, will hold her annual “Crafters Sale” Aug. 5 and 6 with over 170 vendors participating over the weekend. Pictured are vendors and buyers from last year’s event.